» fsck: Inode xxxxxxx seems to contain garbage at boot. fsck: Inode xxxxxxx seems to contain garbage at boot. Today I got at boot the third time in the past three months the fsck error that several Inodes are containing garbage. Every time I ran then fsck manually and accepted the default option to "clear inode". Thus there were always some files missing on root partition which I solved dirty by reinstalling the affected package. - each time it were exactly 16 inodes which "contained garbage"
I spent already several hours searching in the web, but all threads regarding the "inode seems to contain garabge" seemed mostly related to people using a Raspberry Pi with a low quality SD card. 1) can this kind of corruptions happen due to unclean shutdowns or is this more related to a faulty SSD or connection? 2) which part of the filesystem got corrupted? as the files found in /lost+found were intact (checksum) is this possible a superblock corruption? 3) what steps can be done to delimit the cause? Please let me know if I can provide more information. Is this maybe related to https://lkml.org/lkml/2018/11/28/152? Re: fsck: Inode xxxxxxx seems to contain garbage at boot. There is an obscure ext4 fs corruption on 4.19 kernels currently worked on. It is still unclear if ths is a bug in the ext4 driver itself or due to something else. I personally suspect the latter. In the meantime, I suggest you to switch to the lts kernel waiting for the developers to investigate further. As stated the Wiki, data loss should not occur with Kernel 4.15 onwards with the new power setting "med_power_with_dipm". Nevertheless I will give max_performance a try. Discussion of the patch says that the problem may have existed long before, but recent performance updates increased the likeliness of it occurring. Have a look at comments 269 and 276 to determine if you are of the lucky few. I guess the bug only occurs under very rare conditions and very specific (high) loads? Discussion of the patch says that the problem may have existed long before, but recent performance updates increased the likeliness of it occurring. That issue was introduced by 6ce3dd6eec114930cf2035a8bcb1e80477ed79a8 in v4.19-rc1 according to the fix. I suspect the effects of corruption did not hit me immediately. I remember, the day before the third corruption I started Intellij IDEA, which caused my computer to freeze completely. Maybe then something was triggered. Either that bug was really introduced with 4.19-rc1 and I have a faulty SSD or the bug was there long before 4.19-rc1 as it is also indicated by this comment. In the meantime I switched to BTRFS to be a bit more resilient against filesystem corruption. I did also update to kernel 4.19.7.arch1-1 which should already include the patch. The dissenting voice on how long the bug has been present is the author the commit blamed by the git bisection as the cause. My understanding is that all filesystems were vulnerable to the bug the only two that detected the corruption were ext4 and zfs. Only the none queue was supposed to be affected as well https://bugzilla.kernel.org/show_bug.cgi?id=201685#c276 and pre 4.19 the arch kernel was not using MQ for scsi_mod which covers SATA and SCSI devices. Yes. Most people reporting the issue are using ext4. Most linux users in general are probably using ext4. So I don't think there is a causal connection between using ext4 and the corruption. 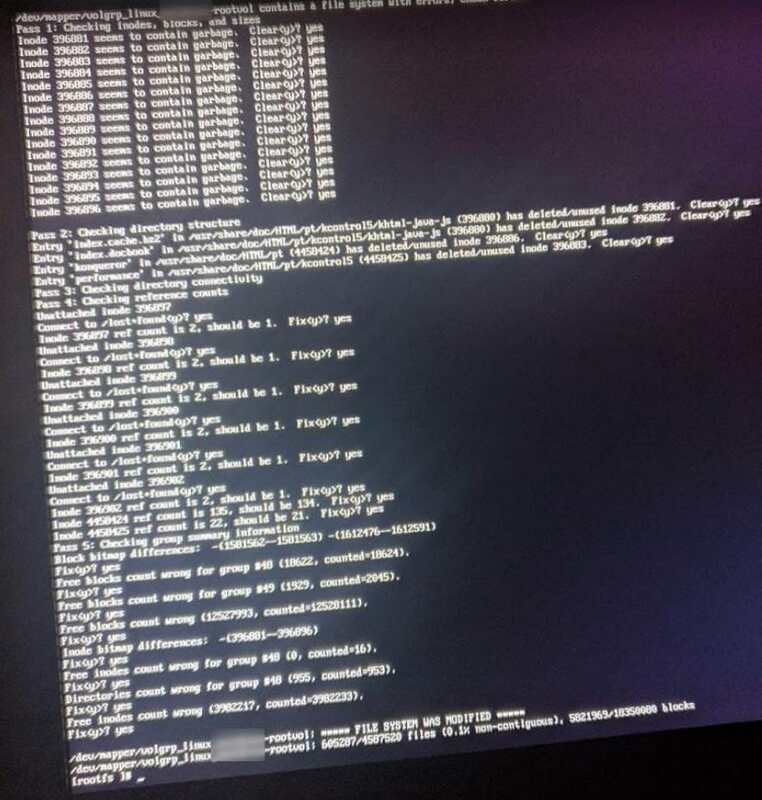 Are you indicating btrfs maybe can't detect this kind of corruption? btrfs can detect even single bit flips, so I assume the filesystem would recognize it. FWIW just to somewhat reinforce my suggestion, there was this 2 page thread, with multiple users reporting corruption after the 4.16 kernel (at which point med_power_with_dipm was enabled by default for laptops so while that mode should be better in general, there still seem to be issues specifically with samsung drives. Thank you for linking this post. I have kind of a déjà vu while reading this. - I saw exactly such warnings too, but didn't spend much attention to them. Currently with 4.19-7 I am not able to see those warnings in dmesg output - even with sata power management set to default tlp "med_power_with_dipm". - I had also some freezes after resuming from sleep. Not as often as the people in the post above, but about 1-2 times a week. If it is true that the kernel bug was only present since 4.19-rc1 then maybe this is the solution. Thanks at all for all the suggestions. Even if the bug was present in 4.18 for you to trigger it you would need to run a kernel with the option scsi_mod.use_blk_mq=1 and with a udev rule that changed the scheduler to none for that device. Then more again, it is probably "just" the sata power management thing. Which is then contradicted by this which is from the block maintainer but does not give reasoning as to why using a scheduler mitigated the issue. * RCU or SRCU read lock is needed before checking quiesced flag. * and avoid driver to try to dispatch again. and __blk_mq_issue_directly is the function containing the bug so if that function is never called the bug can not occur. * For OK queue, we are done. For error, caller may kill it. * previously would have done. * us one extra enqueue & dequeue to sw queue. https://elixir.bootlin.com/linux/v4.19. … t_directly shows the only callers for blk_mq_try_issue_list_directly. I switched to max performance and did not experienced any of my issues again so far. Thanks at all for your constructive hints, tips and very detailed explanations. :-) You rock!